The Band has experienced many high points over the years including playing for HM The Queen at Sandringham, and Prince Charles at the flower show. We have played concerts in Germany and Holland both of which provided us with some very happy memories. However, it is perhaps our recent trip to Belgium which has provided us with our biggest honour. In July we travelled to Ypres, playing a concert in the town square beside the magnificent Cloth Hall. The foundation stone was originally laid in 1200 although the hall was of course laid to ruin in the First World War. The Hall was subsequently rebuilt to its former glory. It was a magnificent setting and the enthusiastic crowd gave a standing ovation after the two hour performance. 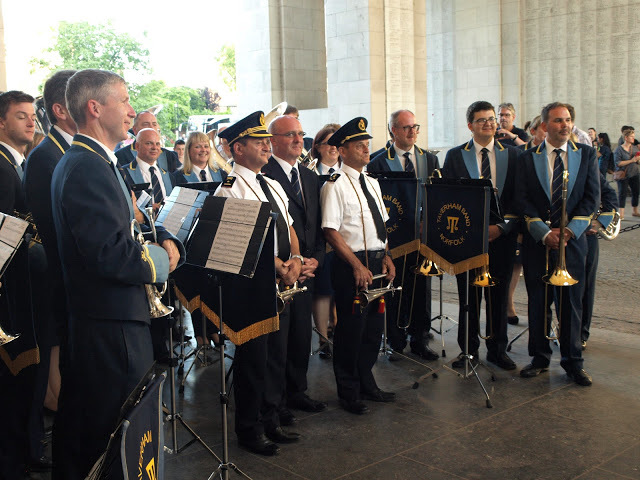 Later that evening we had the incredible honour of playing at the Menin Gate ceremony. 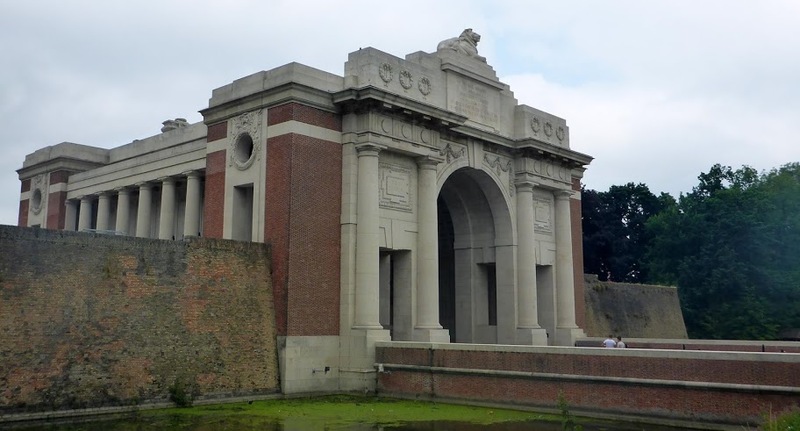 The panels of the gate bear the names of 54,896 soldiers who have no known grave. Every day at 8pm the last post is played at the gate. This has taken place every day since 1927, the only break being during the Second World War. Taverham Band were invited to perform after the last post and we decided to play the theme music from the film “Saving Private Ryan”, entitled “Hymn to the Fallen”. The crowds had gathered well before the performance and then, shortly after the silence, the lone snare drum introduced the piece. The haunting melody crescendos and then dies away, leaving the lone snare drum. This piece truly did justice to the proceedings. The next day we were given a tour of the Tyne Cot Cemetery before visiting the preserved trenches at Sanctuary Wood and the German Cemetery at Langemark . 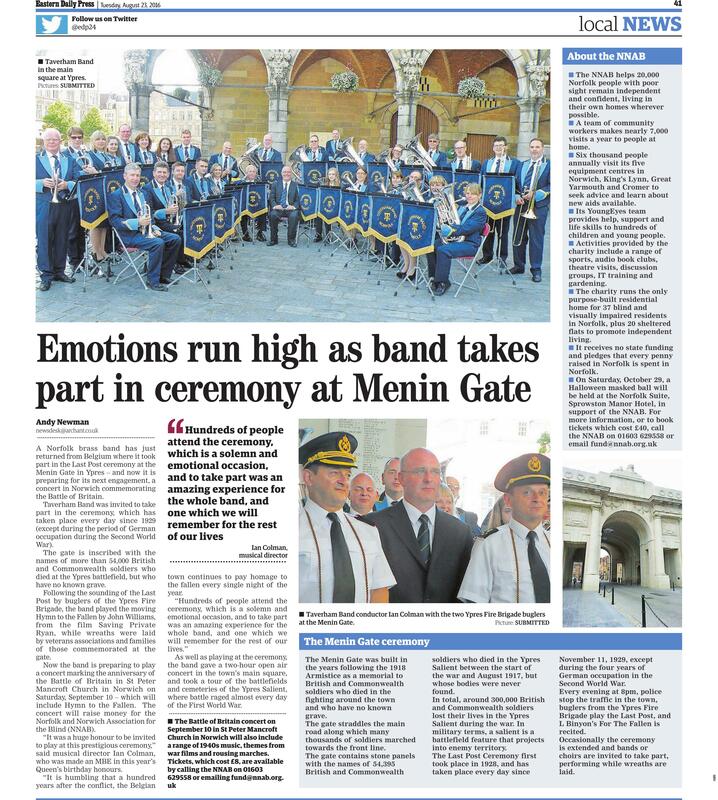 This article cannot to describe the emotions the Band members experienced during this trip and our performance at the Menin Gate will perhaps remain our greatest honour. Photos and other videos are in our media gallery – click here. Our next concerts at Taverham Village Hall will be on Friday/Saturday 14th & 15th October. Tickets are now on sale at Drayton Post Office, Abbotts (Victoria Rd, Taverham), The Sweet Bucket (Taverham Nursery) on line in our shop – click here – or call 01603 868680. There will be a fantastic programme of music and our guests from the façade singers who performed last October will return. We will also be producing our Armistice Day Concert on 11th November at Taverham Church. Full details next month.